Does this look at all familiar to you? This is the old-fashioned way to poll a group of students. Green = Yes, Red = No. Or Green = True, Red = False. 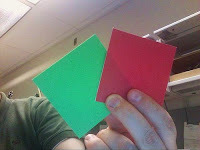 Or Green = 1, Red = 2. You get the point. This is what you can have if you use TurningPoint as your audience response system. 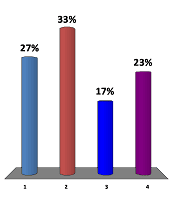 These graphs are automatically generated after you poll your students, and show up on your PowerPoint slide or on your screen (if you are not using PowerPoint). There is also a wide array of other exciting features, from quizzes (including multiple choice and number/text response options) to games. TurningPoint is the brand of audience response system (A.K.A. clickers) that the U has officially adopted. I was just at a training session, and discovered that not only do these fun little gadgets have a lot of features, they're also easy to use, both for the student and for the instructor. If you'd like to learn more about clickers - both how to use the technology and how to use this tool to support effective teaching - register for one (or several - there are a few different options) of the upcoming training sessions in August. What's the cost? Training is free to you as a member of the U community, and instructors will receive a free receiver (which you'll need to collect responses from students' clickers) each time they order 100 clickers to the bookstore. (There are also a few receivers that can be signed out from IMS, and some departments are purchasing their own.) Students will buy their clickers from the U Bookstore, and will be able to use them in any class that incorporates this technology into the classroom throughout their time here at the U. For those who don't want to buy a clicker just for one class, they have the option of paying a small fee to use the service via the web or their cell phone. What are the benefits? Student engagement, anonymous polls, graded questions, automatic attendance taking, etc. See this video of a recent workshop to learn more!